Nicklas Lidstrom isn't only one of the best hockey players of the 1990s and the first decade of the new millennium, he's one of the top defensemen of all-time. 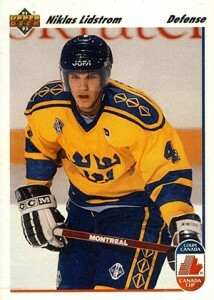 And yet, all of the Nicklas Lidstrom rookie cards can be found for very little. Drafted by Detroit in 1989, he debuted with the team in 1991. By the time Lidstrom retired following the 2011-12 season, he won four Stanley Cups, seven Norris Trophies as the NHL's top defender and was named to 12 All-Star Games. Although known primarily for his defense, Lidstrom still amassed 1,142 points. 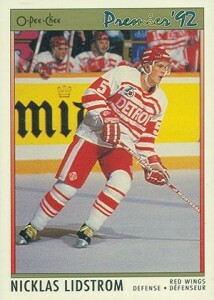 Collectors have more than Nicklas Lidstrom rookie cards to choose from. None of them cost much, no matter how you look at it. Even those getting top grades from professional grading companies like PSA and BGS don't cost much more than the cost of getting them evaluated. It's a result of coming out at the height of overproduction in the hobby. A handful of Lidstrom's rookies have both English and French versions. While technically separate releases, they're all similar save for the text on the back. Parkhurst, Pinnacle, Pro Set and Upper Deck all fall into this category. All of the Nicklas Lidstrom rookie cards trade around the same levels. His Upper Deck card might get a little more, but not much. For those looking for premium Nicklas Lidstrom cards, autographs are definitely a better place to look over rookies. Although they're not exactly rare, the Hall of Famer is far from the most common signer. Many of his autograph cards have also come courtesy of In the Game when they no longer had an NHL license. This makes Red Wings autographs a little tougher to find. Upper Deck, Panini and ITG have also released several high-end Lidstrom memorabilia cards over the years. 9 Different Nicklas Lidstrom Hockey Cards '91-'92 O Pee Chee Premier MORE! 2002 03 NICKLAS LIDSTROM ITG SIGNATURE SERIES AUTOGRAPH AUTO #162 VAULT DETROIT! 2009 10 NICKLAS LIDSTROM O-PEE-CHEE BLANK BACKS RARE DETROIT RED WINGS L@@K!